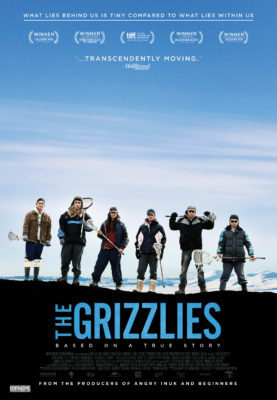 Miranda de Pencier’s The Grizzlies tells a heart-rending tale of a group of Inuit high school students in Kugluktuk, Nunavut who bond together as a family through the game of lacrosse to help combat the record high suicide epidemic in their community. Based on a true story, the film is, in essence, an underdog sports movie and I would go far as to say it’s one of the most touching sports movies I’ve ever seen. For depicting such a distressing and painful subject that is suicide, the film does an adequate job of delivering the urgency of the situation and excellently uses the likeable cast as comic relief to liven the theatre and provide hope. The cinematography thoroughly conveys the barren landscape of the Arctic, reinforcing the resilience of the Inuit people for surviving in such harsh conditions. The Grizzlies is nothing short of an emotional rollercoaster. It’s camouflaged as an inspirational sports movie however really, it’s a poignant depiction of the sad reality among some of the Inuit youth.